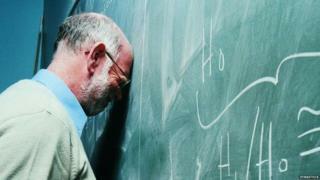 More than half of teachers in England (53%) are thinking of quitting in the next two years, a survey has suggested. The survey, conducted by the National Union of Teachers, found 61% of those wanting to leave blamed workload and 57% desired a better work/life balance. Two thirds of the 1,020 primary and secondary school teachers questioned felt morale in the profession had declined over the past five years. Schools minister Nick Gibb pledged to tackle excessive workloads. The findings of the survey are timely, because last month the five main teaching unions warned of a crisis in recruitment and retention, although the government maintains the vacancy rate has stayed stable at about 1%. The survey, undertaken with a representative sample of teachers, also suggested many were unhappy with some of the government's plans. General secretary of the NUT, Christine Blower, said: "This survey demonstrates the combined, negative impact of the accountability agenda on teacher workload and morale. "Teachers feel that the Department for Education's work thus far to tackle workload has been totally inadequate. "Meanwhile, nearly one million more pupils are coming into the system over the next decade. The government's solution so far has been to build free schools, often where there are surplus places, and to allow class sizes to grow. "Add to this a situation where teachers are leaving in droves and teacher recruitment remains low. We now have a perfect storm of crisis upon crisis in the schools system." She added that many teachers felt their pay had been eroded over a long period of time, and that many were missing out on the 1% pay rise because of the tightness of school budgets. Mr Gibb said teaching remained "a hugely popular profession with the highest numbers of people joining since 2008. "The latest figures show the number of former teachers coming back to the classroom has continued to rise year after year - from 14,720 in 2011 to 17,350 in 2014. "While the vast majority of teachers stay in their roles for more than five years, we know unnecessary workload can detract from what matters most - teaching. "That's why we launched the Workload Challenge and are working with the profession to understand and tackle the top issues that teachers said caused the most bureaucracy, with leading education experts taking action on key areas such as marking and lesson planning."